In the early hours of 15 April 1912, RMS Titanic sank. This page has been written with the help of Year 5 at Streatham and Clapham High School, Junior Department. "The R.M.S. Titanic was built in Belfast in 1912. She was the largest and most luxurious ship built at the time. She measured 269 metres by 28 metres and was meant to be unsinkable." "Titanic was the second ship built by the White Star Line and was the grandest of all three. The Captain, Edward John Smith, was an experienced sailor." "Titanic had a post office and squash court! The Titanic had 16 parts on the bottom floor. If four of the parts got water in the ship would still sail on but if 5 got full it would sink!!! 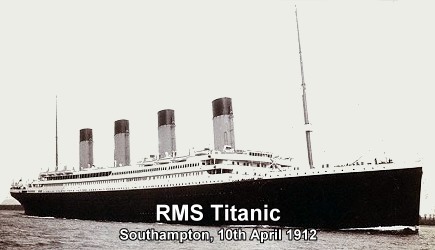 "On April 10 1912 the Titanic set sail from Southampton to New York carrying 891 crew and 1317 passengers. The captain of the ship was Edward John Smith. He was a very experienced sailor. Titanic carried rich people and poor people who wanted to start a new life in America." As the Titanic was touted as the safest ship ever built, it only carried 20 lifeboats - enough to provide accommodation for only half her passengers and crew. "For the first three days she sailed through calm waters, however on the fourth day she was near Canada and the waters turned icy." "At 11:40pm on April the 4th the ship lookout saw a huge ice berg. After steaming too fast the Titanic scraped the side of the hull and made a huge hole in the side. Less than 3 hours later titanic plunged to the bottom of the sea." "The crew had less than 3 hours to fill the life boats with crew and passengers. So many people refused to get off, not knowing what danger they were in." "When the iceberg made the hole in the side of the ship the water was only set to go into four compartments but it flooded more than four. " "Many people refused to get onto the lifeboats, because they believed it was unsinkable. In less than three hours the Titanic sank. Many people at the last minute had dived off the boat but died of hyperthermia. The Carparthia ship came steaming to the rescue. Her crew saved as many people as possible and took them to New York." The liner Carpathia rescued 705 survivors. One thousand five hundred twenty-two passengers and crew were lost. Follow this link to read more of the work by Year 5 at Streatham and Clapham High School, Junior Department. Leonardo da Vinci was born on 15 April 1452 in central Italy. An all-round genius whose paintings and inventions changed the world. 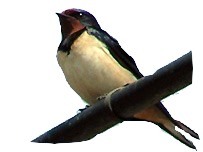 Traditionally 15 April is 'Swallow Day' in England, the date on which the swallow makes its reappearance. Earlier people were mystified by the disappearance of many birds during the winter and at one time thought that the swallow spent the cold months hidden in the mud at the bottom of ponds.